« Around The World In 21 Days: Exploring Cape Town + Penguins! After dropping off my rental car with Hertz (which went surprisingly smooth), I made my walk towards the terminal. 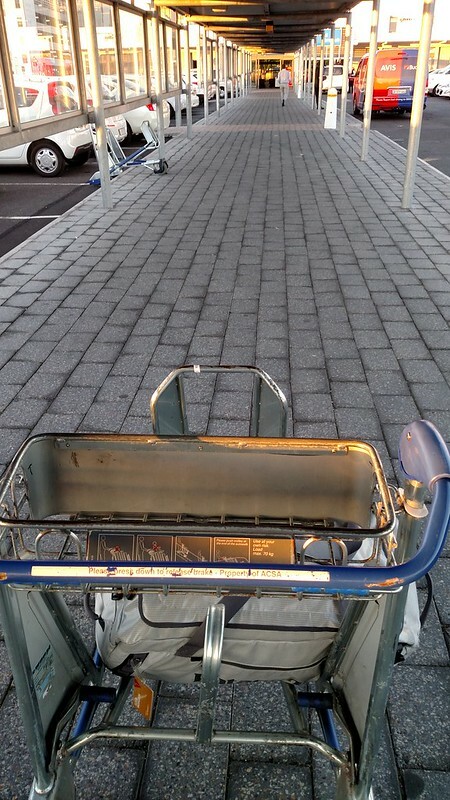 It was easy enough, especially with a luggage cart to take the load off my back from my duffel bag, but it can be a little bit of a hike. 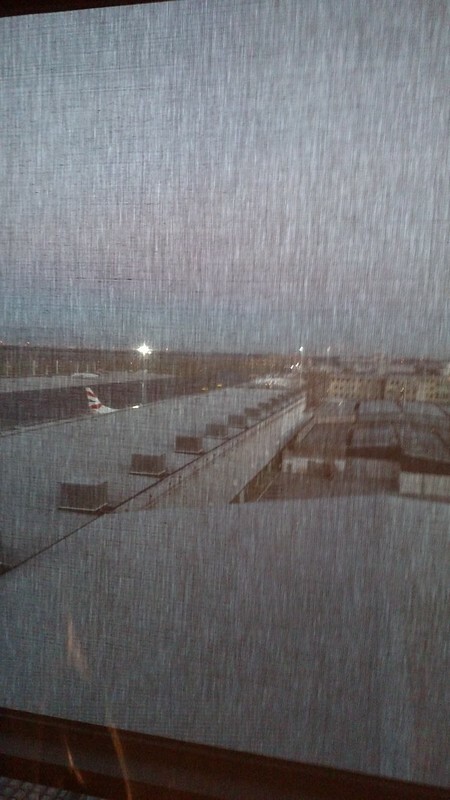 Upon entering the terminal I made my way immediately to the British Airways counters which easy enough to find. The agents here weren’t busy at all and were pretty great; everyone for some reason had to see my Air Berlin card! Perhaps they had not seen one of those before! With my bag tagged and boarding pass issued, I made my way through security and to the airside of the terminal. I decided to look through a few of the shops (always after yet another model airplane), but soon enough was walking into the domestic SLOW Lounge. 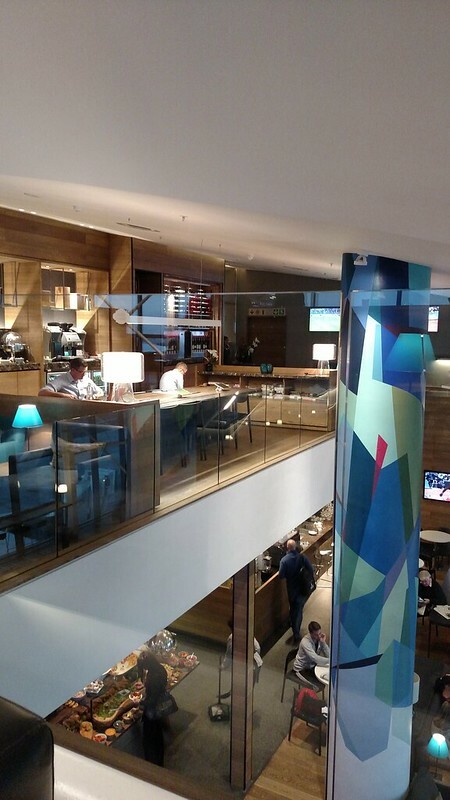 The lobby of the lounge was very much the same as the one in Johannesburg – walking in I presented my boarding pass and Air Berlin Gold card, which was quickly checked and then allowed to proceed inside. 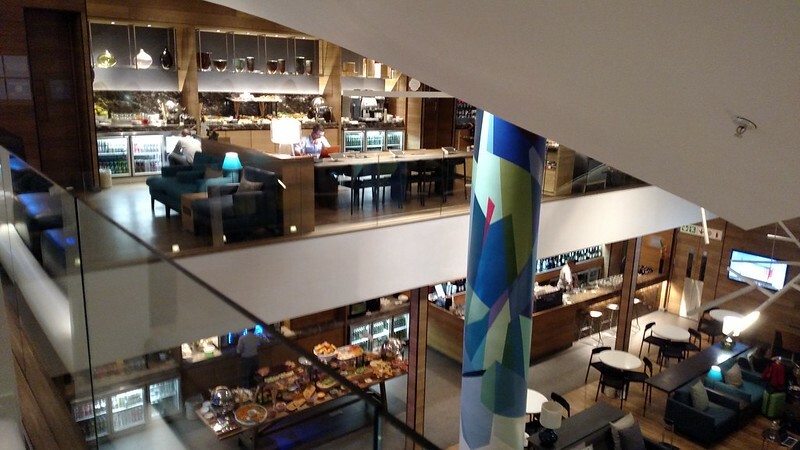 The lounge has the same design styling as the lounge in Johannesburg, however what is different about this lounge is that it is a two story lounge and features a large window that spans both floors in the part that is open. The downstairs seating seemed to be the busiest, so I made my way past the food spread and chairs there and headed up the stairs to find myself a little corner of silence. There was ample seating, with options to look out the windows, sit at the bar, or overlooking the lower level of the lounge. Due to the presence of screens over the windows, I opted to sit with a view of the lounge down below, finding myself a comfortable oversized chair. I should also add that like any good lounge, they did ensure that there were ample outlets for powering up devices, and thus I made sure to get a charge on everything that I could. I didn’t want to get to the hotel that night and find that I had only two outlets to charge all my devices. I had high expectations for the food that would be served in the lounge. Based on what they had for a spread during the breakfast hours in Johannesburg, I knew I was going to get something much better than I would in one of Delta’s Sky Clubs in the US. Let me just tell you, I was not disappointed! Of course if you aren’t comfortable with that, they do have several that do not feature any windows to the outside world. 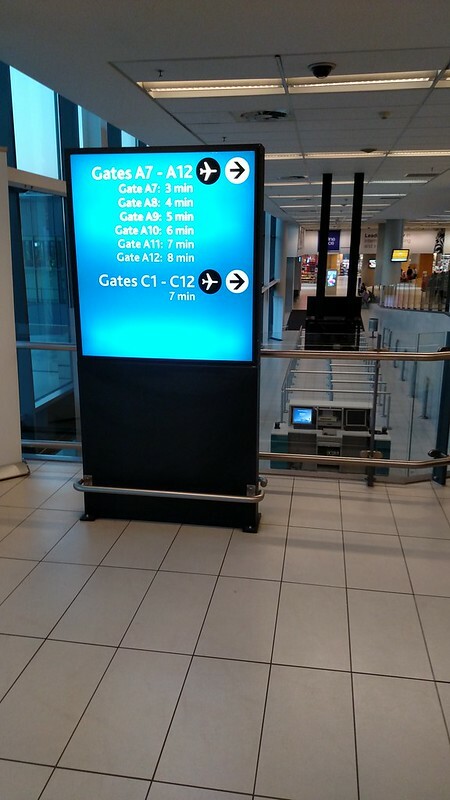 Although I had been keeping an eye on the departure board, I had opted to go ahead and head down to the gate a little on the early side prior to my flight. 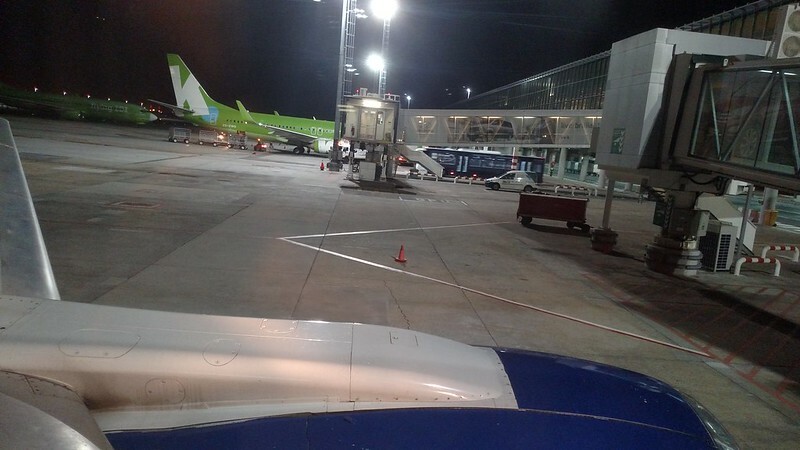 If anything, it was to stretch my legs, plus knowing how boarding went in Johannesburg and that this is probably the busiest domestic route in South Africa, I figured it wouldn’t hurt to be down in the gate area. Unlike in Johannesburg 1) There wasn’t anything to coral the queue and 2) they actually did priority boarding for elites. I was one of the only of maybe a couple of folks who made their way to the front of the line, actually being the first one to board this flight. I figured surely that this would be a full flight, but that was hardly the case! At most, perhaps only half the plane was filled with passengers. This meant that I would have the entire row to myself. Now, when I picked my seats, I had thought that I had booked an exit row. 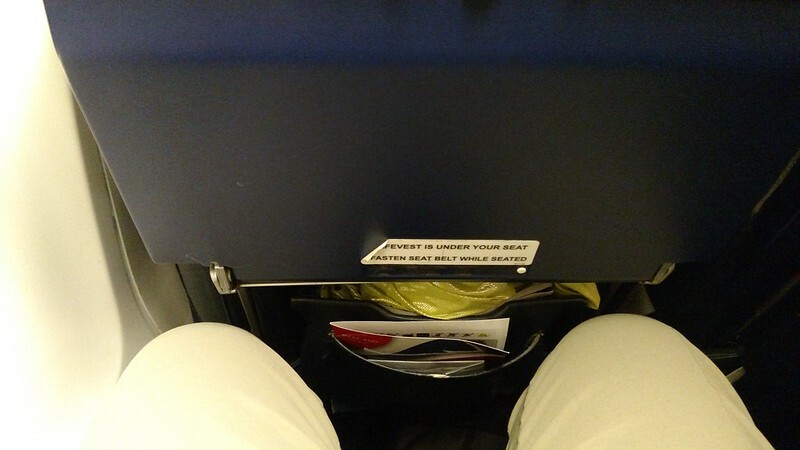 Well, I guess not, as I was seated in the row before the exit row. This resulted in significantly less legroom compared to my JNB-PLZ flight a few days earlier. For a two hour flight that was hardly full, it was at least easy enough to manage! Departure was on time and a quick take off, and as we reached cruise altitude the flight attendants came through to offer the meal options. 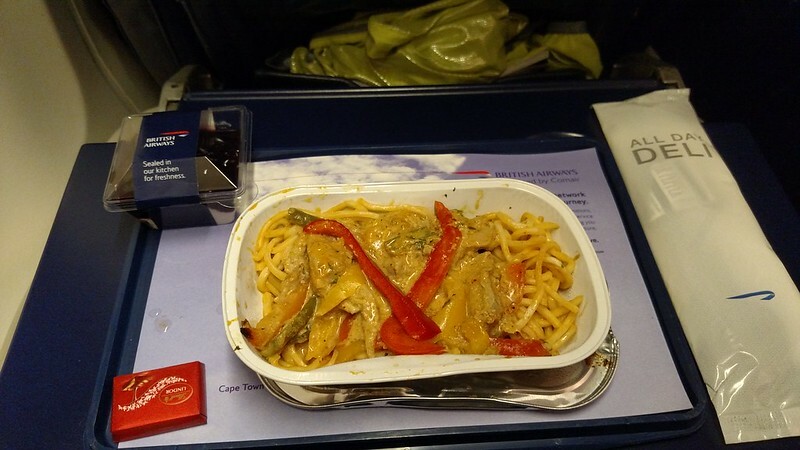 Again, just as with the flight to Port Elizabeth, there was a full meal service with a choice of entrees, of which I had opted for the chicken and pasta. Now, I am not going to go on and on about how this was the best airline meal ever, but it filled the spot since I wasn’t planning to eat dinner once I landed, but that desert was pretty darn tasty. After the meal service though the flight attendants were pretty much non-existent. Not really a problem since it was at worst a 2 hour flight and by the time the meal service was done, we were over halfway there. I enjoyed the rest of the flight looking out into the night while listening to Spotify. With an on-time arrival, I made my way towards the domestic baggage claim where I only waited a few brief moments before seeing my duffel making the rounds. 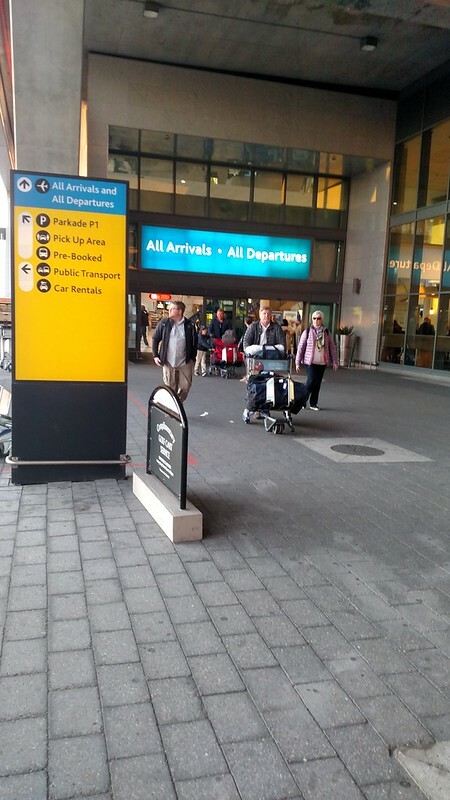 From there it was fun schlepping it to ground transportation – the hotel shuttles seemed to be further than I would have thought and given the weight of my bag, made me wish I had just hailed a cab from arrivals! Of course in getting to the hotel shuttle pick up, there were a number of “helpful” helpers who would tell you when the shuttle bus for your hotel was due to arrive, carry your bags, and want to talk with you. Of course, this is all part of a ploy for a tip, they are by no means official, or at least it did not appear that way. It didn’t seem very nefarious, but I suppose your bags could easy be stolen if (as I watched) you let them take the bag to the back of the hotel shuttle bus to be tossed in and you board before seeing it get stowed. Does it happen? No idea, but why not just be safe and keep control of your bags? 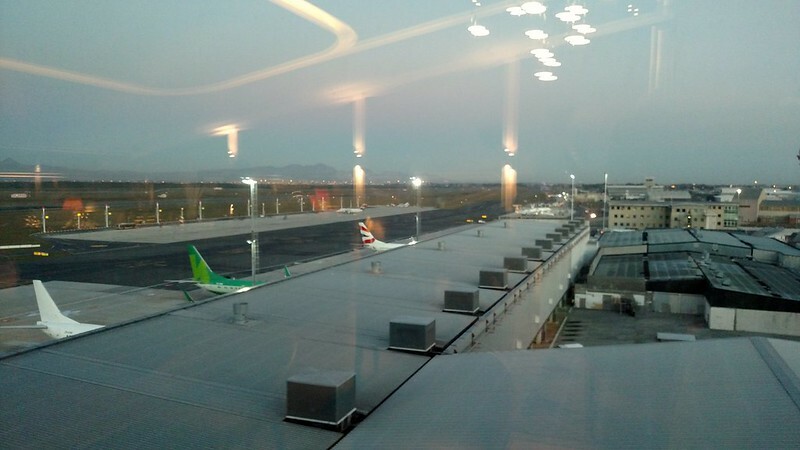 Overall, I was very, very happy with my two flights on British Airways/Comair within South Africa. Elite recognition was good as a Oneworld Sapphire member (I really do owe Air Berlin a thanks on that for matching my Delta Gold Medallion status! 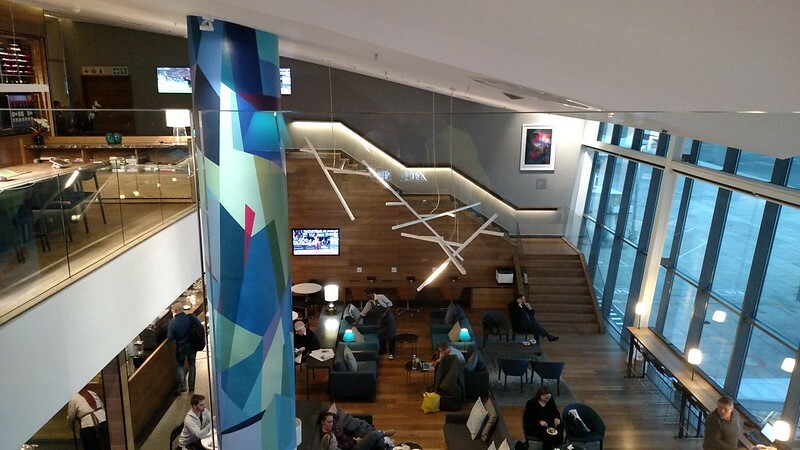 ), the SLOW lounges were phenomenal for a domestic lounge (beats practically any Delta Sky Club that I have been to) or just for any airline lounge really, flights operated on-time with no delays, crews were courteous with decent enough service. Of course some of that is from the fact that I was in Economy versus Business, which I had considered for booking on at least one of my flights as those prices were very affordable. Really, for the average short flight time for most domestic South African routes, you would be hard-pressed to actually pay for Business over Economy. Perhaps if you are traveling during peak days or seasons, there might be an advantage or if you don’t have Oneworld status that gives you access to the SLOW Lounge. To be honest, I think the difference in fares for the two classes was around $50, so it wouldn’t have been a stretch. 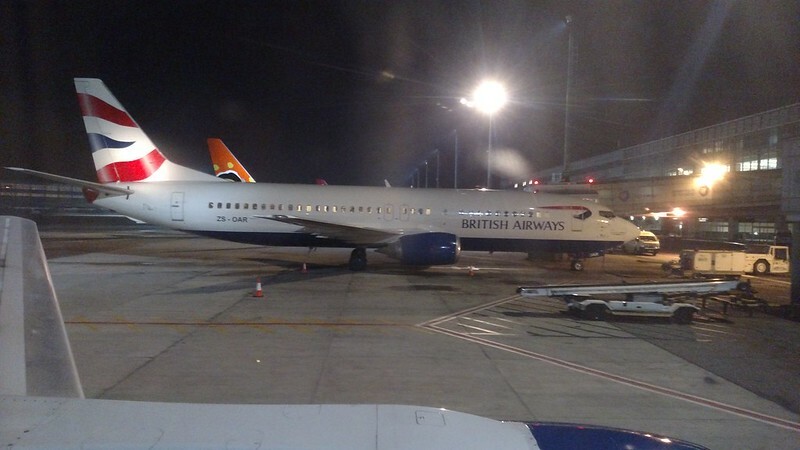 I think if you are used to flying domestically in the US, you’ll find yourself generally happy picking British Airways flights operated by Comair. I know that if/when I make it back to South Africa, I certainly wouldn’t hesitate to fly with them again. 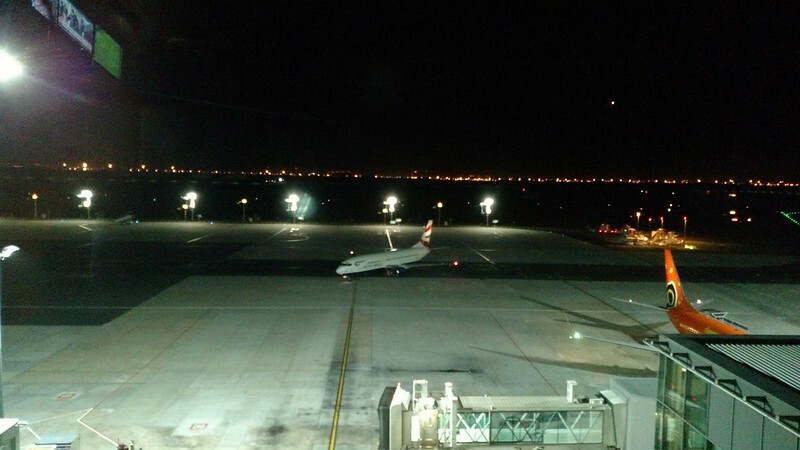 This entry was posted in Africa, British Airways, RTW, South Africa, Travel, Trip Report. Bookmark the permalink. Follow any comments here with the RSS feed for this post. Post a comment or leave a trackback: Trackback URL.